Why aren’t you blogging, my friends ask me. Truth be told, I get tired of my voice sometimes. It rings hollow and whiny in my ear and I can’t bear to expose it to y’all. Go read Slate, your time will be better spent. But lately the urge to write has been spluttering down there amidst my undigested Easter chocolate (did you notice how Reese’s jumped on the bandwagon this year? Pastel wrapped bunnies, eggs, lambs, roosters, Edward from Twilight, you name it they produced it in peanut butter and chocolate. Mmmmmmm). Back to my other urge, the blogging one. It generally appears when people I’m chatting with take the words out of my mouth. They say something – okay, maybe it’s a complaint, whatever – and I say, yes, exactly, a little loudly and over-enthusiastically, causing the other person to back away. Cue the blog post. Lately, it’s about our spring schedules. That is, our over-scheduled children’s spring schedules and the driving involved. The problem is that spring has sprung, but no one informed the winter sports. So they are continuing, even accelerating to two or three practices a week, while we are dusting off our field hockey sticks and baseball bats and trying to make our children well-rounded athletes. Not if hockey and soccer have anything to say about it. The pitfall, of course, is the children will be those two words that every parent fears – left behind – if they don’t carry on with their winter sports, even though it’s spring. So us well-meaning parents, also known as suckers, try to do a little of both, and drive ourselves mad in the process. It could be worse – I could have sired hockey and baseball players, or had nine kids. 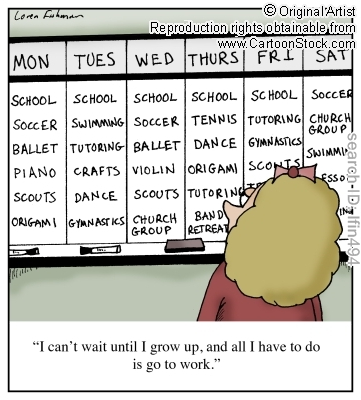 I feel for my friends with boys who have schedules much crazier than mine. There is always the just say no option. I took that route before – that lonely, higher ground – and my kids did pay for it. I feel cornered and bullied into enrolling my kids for yet more soccer (a winter sport in Vancouver), while the reasonable voice in my head wants to just play field hockey, perhaps dabble in track and field, or here’s a thought: go for a bike ride with my kids. Did I warn you that this would not be uplifting? There’s no winner here. If I sound bitter it’s because I am. The sound of silence has settled over the city. Vancouver is nothing like it was this time last year, when it was brimming with Canuck fever from Langley to Horseshoe Bay, from Fort Nelson to Victoria, encompassing not only the city but the entire province. By June it eclipsed the country, with Canadians from coast to coast preferring the Stanley Cup remain in Canada, routing for the Sedin’s and Luongo. No, this time it’s different. As the Canucks hover on the brink of elimination, the mood in the city and environs is so deflated there is almost no oxygen with which to whisper, “Come on, Canucks”, no winds to carry the hope that somehow, our team will rise above its 3-0 deficit to the LA Kings. The fall from glory has been swift – in fact, more like a free fall. From the winners of their regular season division to an almost certain first round play-off defeat – perhaps the worst kind, wherein they can’t even register a single game victory. Fans are trying hard, but failing to close their jaws that have dropped open and are lying in a puddle of beer-infused saliva on the floor of Rogers Arena, the Staples Center, and in living rooms everywhere. This is just not what we expected, not in our wildest Ryan Kesler dreams. A reformed Toronto Maple Leafs fan by virtue of location, I guard myself from heartache during the regular season by not watching; the ups and downs are too taxing, not to mention frequent. But playoffs are open for business. I hop on the Canuck train with glee and look forward to the many social occasions the playoffs present, and the new topics of conversation they bring. It’s fun to participate, and there’s always beer involved. The playoffs, crackling as they are with excitement, seem like a worthwhile investment. For a reasonably athletic person, I am a complete hockey loser. I still don’t understand half of the calls and can rarely decipher a clean hit from a dirty one: every hit on a Canuck seems dirty to me. Henrik’s infamous hit from Game 3 looked all wrong in my eyes, despite the commentator’s remarks to the contrary. I blame it on never playing the game, but this hasn’t held back my ten year-old daughter from understanding everything, and she patiently tries to enlighten me. The playoffs present me with yet another opportunity to understand this national game of ours, to the chagrin of the spectators around me. I’m not always invited back, to be honest. These are my own, personal, hockey limitations that I’m trying to work through. Canuck fans are notoriously fickle, and I don’t want to add fuel to the inferno that has been raging ever hotter as Game 4 rolls around, especially since I’ve herewith admitted to being a firm bandwagon fan. But even so, I’m struggling internally with this decision I’ve made to roll up my sleeves and invest in what could easily and quickly lead to heartbreak. Without getting overly dramatic about it, is it better to have loved, and lost, than to never have loved at all? This year, at least, it was a fleeting romance. Staring into the face of this abbreviated playoff season, it may have been a good one to miss. The playoffs started, but the Canucks didn’t show up. This is the wonder of sports, the thrill of victory and the agony of defeat that happens when an eighth place team handily devours a first place team. But this agony, on the heels of being so close to the biggest of victories last year, tastes particularly sour, and many of us have lost the will to cheer, or even watch. I had a feeling this would be their year. As surely as I knew the rapture was going to amount to nothing, I knew our beloved Vancouver Canucks would make the Stanley Cup final. Call it women’s intuition, or luck, or a formidable amount of knowledge, but let the record show I sensed them, both the Canuck’s success and the rapture’s fail. Check, check. 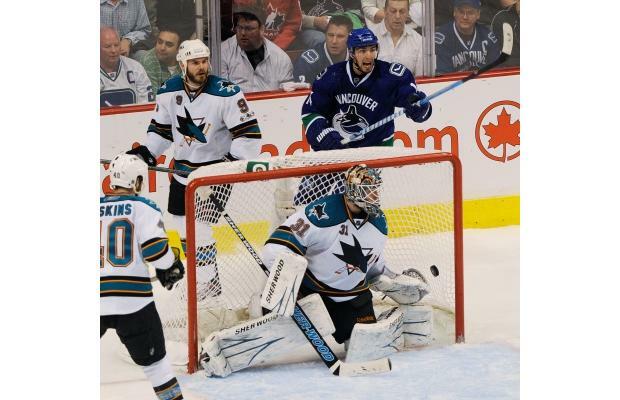 And since I’m on a roll, I’m going to go ahead and predict the Canucks are going to win the Stanley Cup in six games. In fact, I guarantee it. I would bet my life on it, and will do so tomorrow if I can find a bookie. You see, I have a plane ticket that will jet me away from my city, united in Canuck fever and awash in flags, on June 6, so the way my life goes the Canucks will win the cup right after I leave and the party of all parties will begin in Vancouver, while I am sitting in Europe. Granted, a great place to sit on any occasion, but it is simply just my luck that I will be there when I most want to be here. I’m not complaining, I’m just illustrating why you, too, should believe Vancouver will win the Stanley Cup this year. You may want to put money on it. A case of schadenfreude, on my account. A gift from me to you: all Canuck fans everywhere (and surely Canada, we are all Canuck fans at this point: it has been far too long since Lord Stanley’s silver trophy has resided north of the forty-ninth parallel). 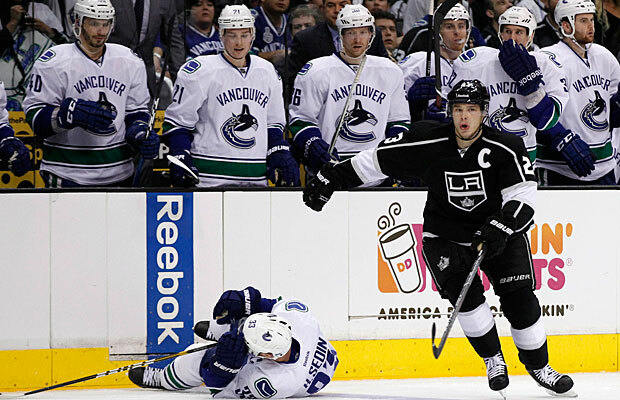 There are a few other reasons, of course, why you should believe in the Canucks this year. I mean, besides the fact that they have more heart than all of the NHL together and possess an uncanny ability to pull a rabbit out of a hat when it matters most. And overlooking the fact they were the most decorated team in the league, winning this trophy and that trophy, I won’t bore you with statistics or titles. Google it, they were the winning-est team among them. But that makes it almost too obvious. Let’s look for reasons more subtle and wacky. Perhaps this little gem: our Olympic golden ticket. When Montreal hosted the Winter Olympic Games in 1976, the Canadiens won the Stanley Cup in 1977, and similarly the Calgary Flames won it in 1989 after hosting the Olympics in 1988. Subtle enough for you? Sports fans are a superstitious bunch and unearth strange facts in lieu of being able to put the puck in the net themselves. Everyone noticed tonight when Henrik Sedin refused to touch the trophy for winning the Western Conference tonight, since that’s not the prize they care to win. Yet the last time the Canucks advanced to the Stanley Cup final (but then lost to the New York Rangers), in 1994, our captain not only touched the trophy but RAISED it over his head. You see the difference this time? It may as well be written in the stars. There are plenty more theories floating around, but I assure you the best one is my conspicuous absence from the city when it all goes right for a change. It’s my way of taking one for the team. You can thank me later. We are all Canucks, after all. 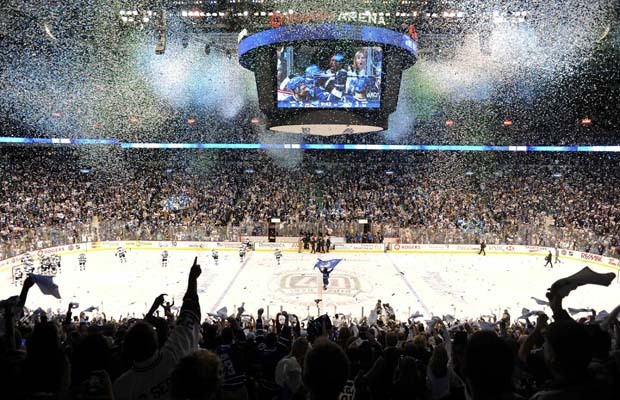 Canuck fever is burning hot in Vancouver, as our beloved hockey team is off to the semi-finals of the Stanley Cup. Blue and white flags are flying from cars and the lions on the Lions Gate Bridge have donned Canuck jerseys. Go Canucks go can be heard from the deepest, darkest recesses of our mountains as even the black bears have boarded the bandwagon. But I’ve heard almost as much about the antics of the Green Men as the lackluster play by our team’s infamous twins, the Sedin brothers. In fact, these two pranksters have vaulted to popularity during these playoffs as fast as the Swedish twins have fallen from glory. The Green Men have become an institution in Vancouver since 2009, when they first appeared on the scene in seats beside the opposing team’s penalty box. As their name suggests, they appear in the stadium wearing skintight green lycra suits. 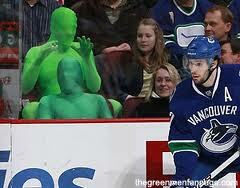 Whenever a player sits in the sin bin, the Green Men come to life, taunting and cajoling the player. The home crowd generally loves them, they are more interesting to watch than Finn, the official mascot. Their object is to get under the competitors skin, in the hopes that it throws them off their game. If you’re a Canucks fan, this seems noble enough. If you’re on the other side, it seems rude and unsportsman-like. Thus the clash of controversy. Nevertheless they have grown in popularity, and are now not only a fixture during home games, they traveled to Nashville to continue their pranks beside the penalty box. But recently our bonafide mascots have come under fire. The NHL has asked the Green Men to stop doing handstands and banging on the glass. 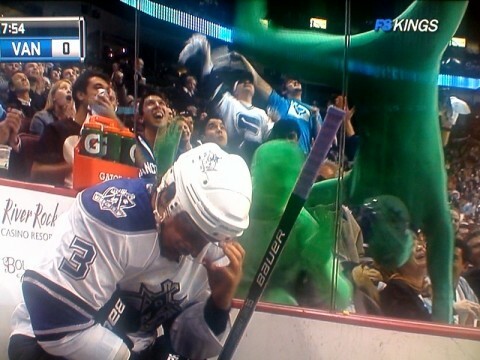 The Green Men responded by bringing a cardboard cut out of themselves to the next game, and inverting their likeness on the glass so that they weren’t doing the handstands, only their cardboard selves were. Don Cherry, Hockey Night in Canada‘s hilarious and outrageous commentator, weighed in between periods in Game six of the Vancouver/Nashville series, with a message to the Green Men: Don’t be mean, keep it clean. He was referring to the Green Men’s recent gag, bringing a cardboard cutout of Carrie Underwood wearing a Canuck jersey. Underwood is married to a player on Nashville’s team, and they taunted him with the picture when he was in the penalty box. Don felt they crossed the line of acceptable behavior by bringing a player’s wife into their act. Love them or hate them, they are stirring up controversy and bringing another element to the game that Canadians are already passionate about. They are providing entertainment for the lower bowl and much fodder for the news outfits and local radio shows. For ardent fans, it begs the question: how much is too much? Are the Green Men taking away from the game, or adding an element of fun? It’s Motivational Monday, and today I want to tell you about a friend of mine who is charming, thoughtful, intelligent and beautiful. She is passionate about life and throws herself hook line and sinker into her family, business, friendships, and her active life. Christine Fletcher also happens to be a professional triathlete, but she doesn’t exactly wear that on her sleeve. I met her in my book club, a motley mix of incredible women (I look around the room and wonder how I sandbagged my way in), largely of the sporting persuasion. There is often talk of a race experience, training regiment, or an outdoor adventure. But not from Christine, who more often than not has won a race since our last meeting. We need to pry this information out of her, her modesty is legendary. This is in stark contrast to myself, who wears my finisher medal for days while doing errands. Her ability to train 3-4 hours a day, and be so accomplished and recognized in her sport, yet rarely mention this tidbit, is a feat unto itself. Whereas I ponder the incredible act of will required to complete one Ironman triathlon (just to recap, an ironman is a 2.4 mile swim, 112 mile bike ride, followed by a full marathon, 26.2 miles), and then roll over for my afternoon nap, Christine has completed this distance nineteen times in races. Imagine the thousands of training miles she has logged to prepare herself. I try, but frankly find it difficult to imagine. If pressed, she will reveal an encyclopedic-like knowledge of anatomy, nutrition, sports-related injuries, and optimal training practices. Knowing her is like having a coach, sports medicine doctor and nutritionist at your fingertips. She is much more forthcoming and willing to share her knowledge, less so with her victories. In the past few months, her off-season, she won the Vancouver Diva on the Run 8 km race, and the Sigge’s 30 km Skate Ski race in Callaghan. 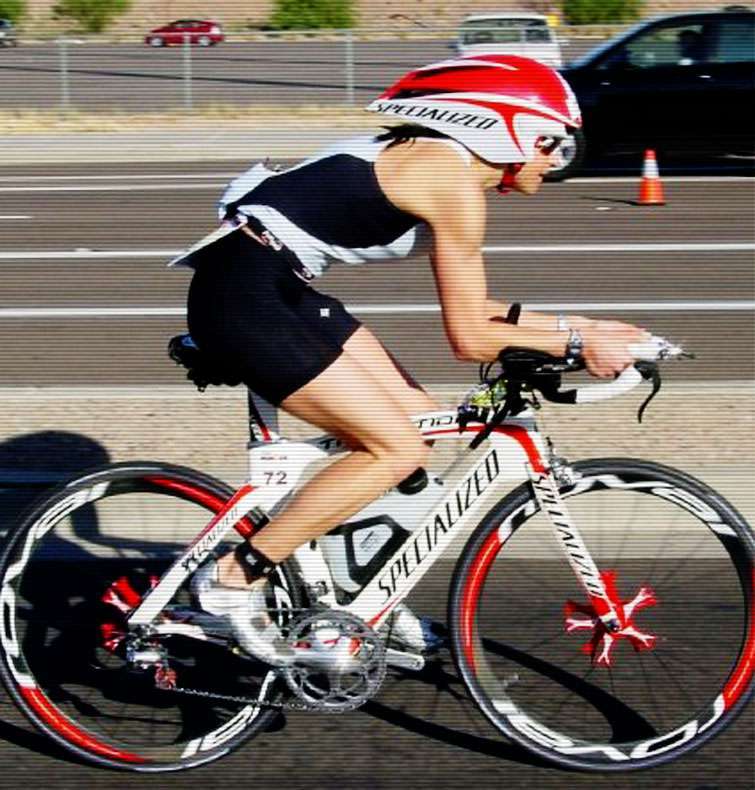 In the last couple of years she has focused on the Half Ironman distance, and success has been rolling her way, finishing on the podium frequently at major events. Last week she was named to the team representing Canada at the Elite Long Distance Triathlon World Championships that will be held in Nevada this fall. “This sport is a stimulus for challenge. I believe the human body has a limitless potential if trained properly, and love to see how well I can hone this,” she says, when I ask her about her continual dedication to her sport. A little story to illustrate her passion: I remember I was training for a race when my knee started hurting. To me, this meant I was injured, and I needed to halt my training until it passed. When I mentioned this to Christine, she asked me what I was doing about it. Confused, I said, well, nothing, I’m injured. I told her my symptoms, she diagnosed them instantly and sent me to a chiropractor. After a few sessions of active release therapy I was back on the road. To many people, pain is a reason to stop. But for athletes like Christine, pain is simply a puzzle that needs to be solved. She just works harder until it’s fixed, whether the answer is massage, stretching, a nutritional change, physiotherapy, active release or rest. Whereas I would take hundreds of training miles a week as license to eat freely and with abandon, Christine looks at nutrition as the cornerstone of a successful training program. She focuses on a balance diet of protein, carbohydrates, and fats by eating fruits, vegetables, and lean proteins, with an emphasis on foods rich in antioxidants. She is a big believer in additives like Udo’s Oil for recovery and stamina, and sips on things like Vega shakes between workouts, an optimal combination of carbohydrates and hemp protein. She is currently being coached by her long time training partner, friend, and hero, Jasper Blake, a Canadian icon in the triathlon world. He has been focusing on speed, intensity and strength, while integrating rest weeks into her program. 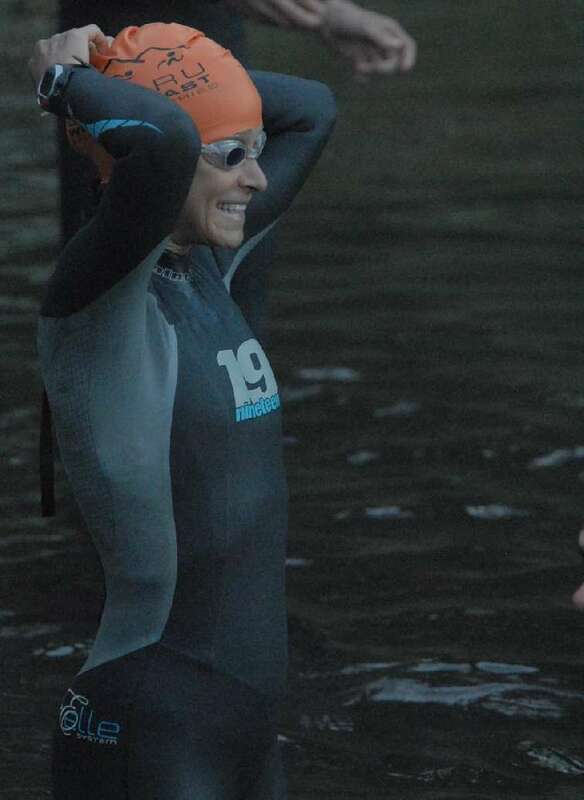 As a result, she feels energetic and excited about her upcoming season, which kicks off this month and will culminate in the Ironman World Championship 70.3 in September, and now the Long Distance Triathlon World Championships in November. Both events will be held at Lake Las Vegas, Nevada. On top of everything she does, she somehow makes time to blog about her race experiences. I particularly love this because it is here, in her blog, where I see the dedication and focus she has for her sport, more so than the odd occasion where we meet for lunch or drinks. She writes poetically about this object of her affection, beloved triathlons. It’s hard for readers not to be equally enamored, even from our armchairs. Here’s to you, Christine, for motivating me to get out for my workout even when it’s raining, and for teaching us all that modesty is a beautiful thing. Nothing says midlife crisis louder than a shiny new set of wheels. But in my case, it was a two-wheeled vehicle for which I pined upon hitting forty. For the record I don’t think it was a midlife crisis. I just really wanted a new bike. It was time. I watched with envy as cyclists breezed past me, shiny and sleek in their brightly coloured jerseys. I wanted a piece of that action, but my current mode of bike transport was twenty years old. Looking at its mangled frame floods me with memories of Melrose Place, Desert Storm, cheap beer, and drama. It had carried me around my university campus and around the streets of Vancouver before I owned a car. It had been run over by my roommate when I had dropped it on our driveway (sorry roomie; I know I was hard on you for that), was rebuilt and continued to roll. More recently, the stuffing began falling out of the seat, so every year I added a piece of duck tape. Finally, when it was all duck tape and no seat, my husband said, “Really?” as I dusted it off for our family bike ride. I gave in and bought a new seat, but the bike continued to shine in my eyes, all fifty pounds of it. Rusty, but otherwise bright as the day I bought it. A perfect indigo blue with neon pink accents. A mountain bike built before shocks were invented, it was perfect for commuting, not so much for trails or triathlons. It had its limitations. 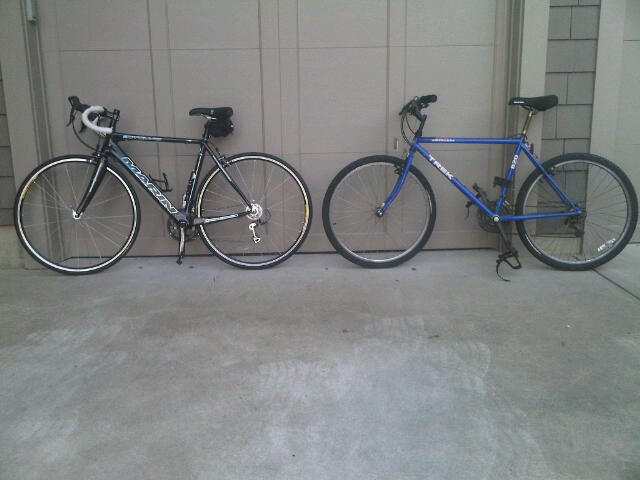 I loved my old bike, but even I, faithful as I was, recognized its shortcomings. As my fortieth birthday loomed, there was one thing and one thing only on my list: a new road bike. To secure my future purchase, I registered for the Granfondo, a bicycle race that starts in Vancouver and ends in Whistler, a 130 km journey with substantial elevation gain. My bright blue Trek was not going to cut the mustard, new seat notwithstanding. On one of those spanking new road bikes, how hard can it be? They are so light that the mere thought of pedaling propels its slight form a kilometer or so. It’s not like I’m running 130 kilometers. Surely there will be coasting involved. And so, for the sake of the race and to celebrate my midlife, I bought a carbon road bike. It is featherlight and built up in all the right places – a high performance model. In the small print I spied the words guaranteed to finish the Granfondo in four hours and it was a done deal. It should be noted, I’m not the first to trade an old model in for a new one at this point in life. It’s my first official Motivational Monday, and fittingly I am profiling someone who has actually been motivating me for a long time: my friend, Ruthie Shugarman. She’s the kind of person who goes a mile a minute, but has all the time in the world for you. I’m not quite sure how she fits into the day all the things that she does – her efficiency meter works overtime, and I’m suspect that she squeezes thirty hours into each day, somehow. Ruthie is passionate about a lot of things, among them her family, friends, real estate and charities. And now, thanks to the Ride to Conquer Cancer, she has a new passion and sport in cycling, and one more charity to add to her long list. I’m not sure how she slots it all in, but like everything else she does in life, she has taken on the Ride to Conquer Cancer with energy and vigor, a force to be reckoned with. 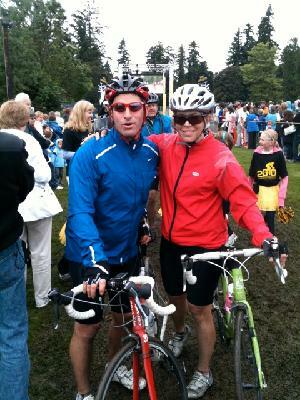 The Ride is a two day cycling event that starts in Vancouver and ends in Seattle. Each participant is responsible for raising $2500 for the cause, with many riders exceeding these expectations. Last year Ruthie was part of Team Dexter, which raised $112 000. I love Ruthie’s ability to turn negatives into positives. She became a realtor three years ago – after owning her own event planning business for thirteen years – because of her passion for the housing market. But just as she struck out on her own, the housing market took a drastic turn for the worse. “It was actually a great time to be learning the ropes.” Properties weren’t moving as quickly so she could immerse herself in each transaction. Not only has she stuck with it, she was recently recognized as the third highest producer for individual sales in her company. When times got tough, Ruthie got creative. During this down market, she had the idea of putting her event planning background to good use. She organized a clothing swap amongst her friends and clients (of which I am a huge fan, since not only is it fun, it seriously augments my wardrobe). Her plan was to host a social event that would benefit women at a time when money was tight, and at the same time introduce herself as a Realtor. Her clothing swaps have turned into a hugely successful biannual event, benefiting not only her clients and friends but also several local charities, such as Avalon Addiction Center, Covenant House, and Dress for Success. Think about it: busy mother schlepping children to and fro, full time Realtor, decides to take up a new sport and a new cause. Before joining the Ride, Ruthie didn’t own a bike, so getting suited up was no small endeavor. And then there is the small issue of the shoe clips. “I was terrified to ride on the road at first,” she says, “ and only began clipping my feet in three weeks before the actual race.” But she was pleasantly surprised about how social the training was, frequently riding to Steveston, Deep Cove or Horseshoe Bay with groups of people. Stopping for coffee was an integral aspect of the rides, which suited her perfectly. Multitasking at its best. Ruthie is busy starting her training for the Ride to Conquer Cancer this June and has kicked off her fundraising campaign. Very appropriately, since April is daffodil month for the Canadian Cancer Society, a time to raise funds and awareness for the disease that impacts so many. I am forever motivated by Ruthie’s ability to fit into an hour what I fit into an entire day. Her cup is full, yet she always finds room for more. Let’s help warriors like Ruthie in their fight to conquer cancer. Donate generously, and watch out for cyclists on our roads.